Elections present voters with important choices. While you might believe your one vote out of the hundreds or thousands cast will not make much of a difference, understand that every vote counts, and helping to elect your next representative in parliament is both your democratic right and a very important civic duty. Sometimes it may be difficult for voters to decide on the best candidate for the job. All too often, slogans, name recognition and personality are all that come through in an election campaign. This makes difficult to move beyond a candidate’s image to the substance of a campaign. However, it is possible to move beyond style to substance. Here is a guide to help you judge a candidate. The first step is to know in which constituency or electoral district you will be voting – this determines the candidates involved. Depending of the electoral system you may be either voting for an individual candidate (first-past-the poll), a list of candidates (proportional representation), and a combination of these. Be sure to include minor party and/or independent candidates. Your first step in picking a candidate is to decide the issues you care about and the qualities you want in a leader. When you consider issues, think about community or national problems that you want people in government to address. Also, consider what party the candidate belongs to and the typical stance the party takes on the issues. For example, you may be interested in the economy; government funding of education or health care; or how they will tackle the unemployment situation. You should also consider leadership qualities. Think about the characteristics you want in an effective leader. Do you look for intelligence, honesty, an ability to communicate, or other factors? Remember that you need to be realistic; nobody is perfect. After considering which issues and qualities are most important to you in the campaign, record them on the Candidate Report Card. As a voter, you help decide who will lead your country through voting for the candidate of your choice for your electoral district or constituency. The Candidate Report Card allows you to rate the various candidates in an elections based on specific criteria that you have identified. 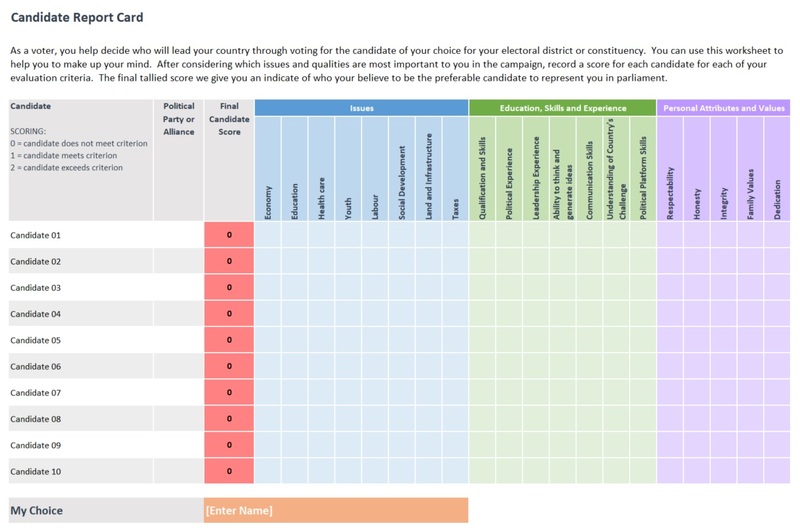 After considering which issues and qualities are most important to you in the campaign, record a score for each candidate for each of your evaluation criteria. The final tallied score we give you an indicate of who your believe to be the preferable candidate to represent you in parliament. Television and radio commercials: When you see or hear a paid political ad, ask yourself some questions. What did you learn about the candidate from the ad? Did you find anything about issues or qualifications? Or was the ad designed only to affect feelings or attitudes about the candidate? How important was the music, the setting, the script? Was the ad designed to appeal to women, minorities, older voters, single-issue groups? You can learn about issues, even from a 60-second TV or radio commercial, if the candidate wants you to, or if you can separate the glitter from the substance. Direct mail: Increasingly, candidates are using direct mail to solicit funds or votes. Technology has made it easy to send “personalized” appeals to selected groups of voters. Candidates can send one message to members of women’s groups, for example, and another to public workers. You must read between the lines to get the full story, the direct-mail letter can help you understand the candidate’s stands on issues. Recognize that the letter is a campaign tactic, and try to see what you can learn from it. Pamphlets and flyers: A leaflet slipped under your door or handed to you at the store may contain valid substantive information or it may be full of superficial imagery or even lies, distortions, or evasions. Read it critically. Does it tell you more about the candidate’s devotion to family than about qualifications or stands on issues? Be on the lookout for accusations or other statements about opponents, especially if made so close to Election Day that they cannot be answered or denied. Emotional appeals: Listen to a candidate’s appeals and arguments. Then decide if they are targeted to your emotions alone. Is the candidate trying to make you mad enough to accept certain arguments without question? Maybe a poverty-stricken childhood should get your sympathy, but it should not get your vote. Look for the facts. Do not be swayed or carried away by political bombast. Learn to spot manipulative techniques. In a local race, interviews with the candidates can be helpful. For incumbents, a look at their voting records on issues that you have listed as important can tell you the candidates’ positions on those issues. You should also read the manifestos of major parties and see with which one you identify with the most. As you analyse the information you have collected, determine if the information gives you an overall impression of the candidates. What specific conclusions can you draw about the candidates’ stands on issues? You should also read about their views on issues before they began campaigning for public office. Often, this is much more revealing of the true stance on issues than what they say during a campaign. Fill in the Candidate Report Card, as you gather new information about the candidates. Who do you feel is a generally honest individual? Is the candidate strong in character/morals? Is the candidate one that has been up front and honest about all aspects of his life, and past? Does the candidate surround himself/herself with people that you can also respect and trust? How can you know if someone will be honest, open, or able to act under pressure if elected to office? How prepared do you believe the candidate is for the job? Observe the candidates’ campaigns. Do they give speeches to different groups – even those groups that may disagree with the candidates’ views on issues? Do they accept invitations to debate? Do the campaigns emphasize media events, where the candidates can be seen but not heard? For instance, a candidate is seen cutting ribbons to open a new library rather than talking about education. Now that you have accumulated information from campaigns and other sources, you will want to learn what other people think about the candidates. Their opinions can help clarify your own views, but do not discount your own informed judgments. You may be the most careful observer of all! Throughout the campaign, opinion polls will be taken by a variety of groups to evaluate public support for the different candidates. Polls reveal who is leading at a certain point in the race. This information can be crucial for a candidate because it can increase support and contributions from people who want to be on the winning team. As you read the polls, ask these questions: Who sponsored the poll? Was the poll produced by a trusted and independent group? Were all the figures released, even unfavorable data? What kinds of questions were asked? Were they slanted or unbiased? How were respondents selected – randomly or in such a way to include all segments of the population? How many people were included in the poll sample? Name calling/Appeals to prejudice: These are attacks on an opponent based on characteristics that will not affect performance in office. Accusations such as, “My opponent is arrogant and full of hot air,” do not give any real information about the candidate. Reference to race, ethnicity or marital status can be subtly used to instill prejudice. Rumor mongering: These include statements such as, “Everyone says my opponent is a crook, but I have no personal knowledge of any wrongdoing,” which imply (but do not state) that the opponent is guilty. Loaded statements and questions: “I oppose wasteful spending” doesn’t say much, and it implies the candidate’s opponent favours it. If a candidate gets away with an empty claim like that, he or she may never have to account for identifying which expenses are necessary and which are just fat. Guilt by associations: These are statements such as, “We all know Candidate B is backed by big money interest,” that attack candidates because of their supporters rather than because of their stands on the issues. Catchwords: These are phrases such as “Law and Order” or “un-American” designed to trigger a knee-jerk emotional reaction rather than to inform. Passing the blame: These are instances in which a candidate denies responsibility for an action or blames an opponent for things over which they had no control. Promising the sky: These are unrealistic promises that no elected official could fulfill. Evading real issues: These include instances in which candidates may avoid answering direct questions, offer only vague solutions, or talk about the benefits of proposed programs but never get specific about possible problems or costs. Baiting: Politics is a tough game. But badgering and intimidation are unfair campaign tactics. Think twice about a candidate who tries to make an opponent look weak or out of control by harassment until she or he flies off the handle or says something rash. Which candidate’s views on the issues do I agree with the most? Which candidate has the leadership qualities I am looking for? Narrow down who you think has the knowledge and commitment to be a good representative. Is the choice clear? If so, pick a candidate. Sometimes voters may be supportive of a particular party but not necessarily the party’s candidate for their electoral district or constituency. If you have a great candidate who can have a positive impact but does not belong to your favourite party, you will need to decide if you should still vote for your party instead of for the best candidate. Remember that voting is a highly personal decision and that your ballot remains secret. No politician, either in government or in opposition, or any other person for that matter, knows for whom a person has voted. Check the opening time for polling stations in your country. If you are employed, your employer must allow you a reasonable period for voting. Your employer cannot stop you from voting, nor can your employer require you to take time off without pay.